Birthdays, family get-togethers, first dates or a special dinner – candles set the mood and tone for every occasion! While a dinner date calls for red candles, family dinners demand sophisticated tapers to embrace the occasion. Candles simply turn the magic on for each event! Scented, aromatic candles light up your mood and the occasion. The only trouble – the wax melts! And the candles become worthless. So how do you keep them going for hours and hours? Well, simply don’t use wax! Yes, you heard that right. 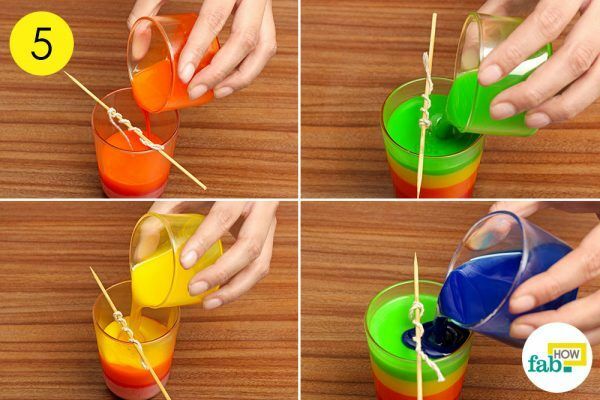 It is possible to make candles without wax, and very easily and quickly, too. Not only will they set the mood for a special day but also help you in times of blackouts. The best part is you can use your favorite colors and fragrances to match your mood and decor! 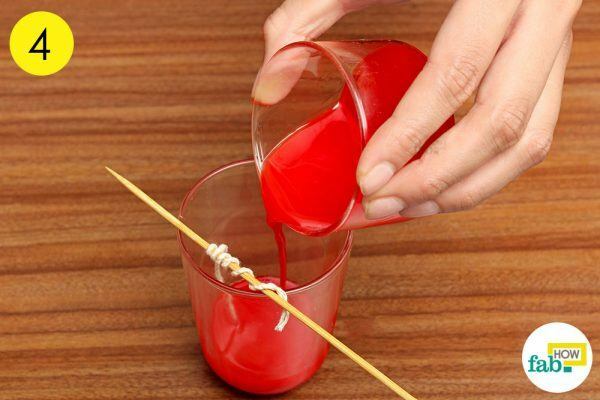 Here is a guide to 3 different methods with pictures for making wax-free candles at home. 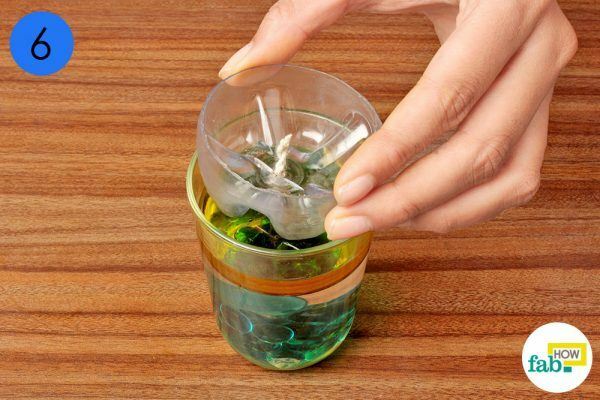 Using a pair of scissors, cut the bottom off a plastic bottle in a circle. 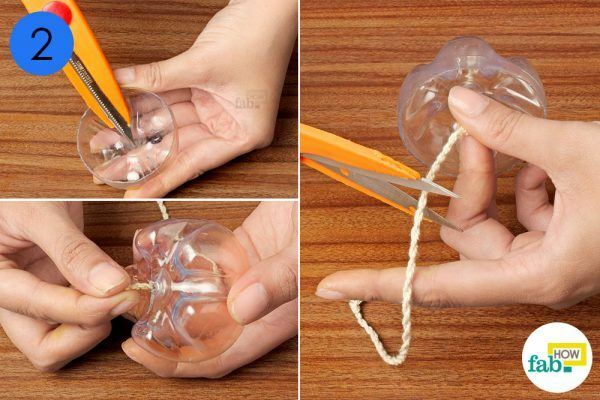 Grab a compass or use the tip of the scissor blade to make a hole in the center of the plastic circle. 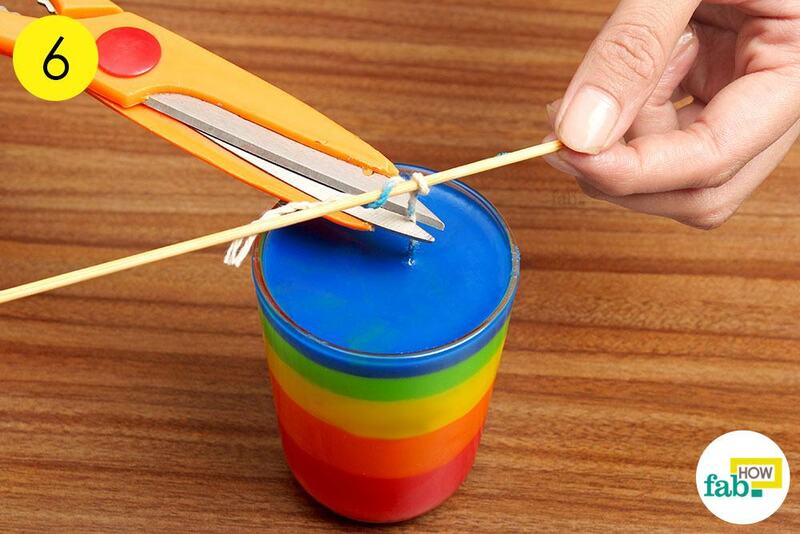 Thread a candle wick through the hole and cut off the excess wick. 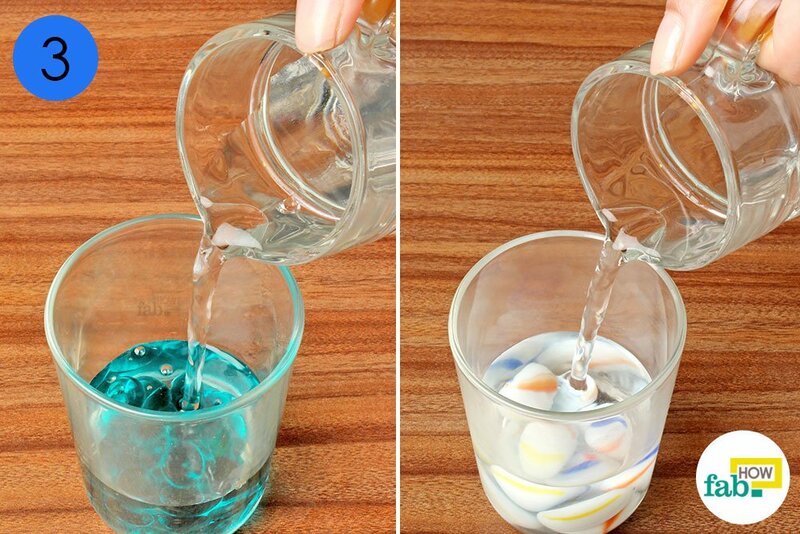 Put some marbles into a glass cup and pour water over them. 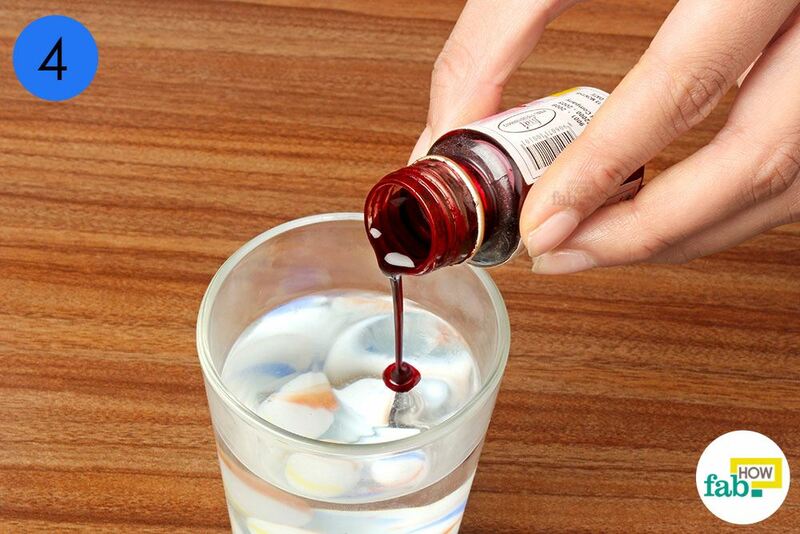 If you used transparent or white stones, you may add a few drops of your favorite food coloring to the water. 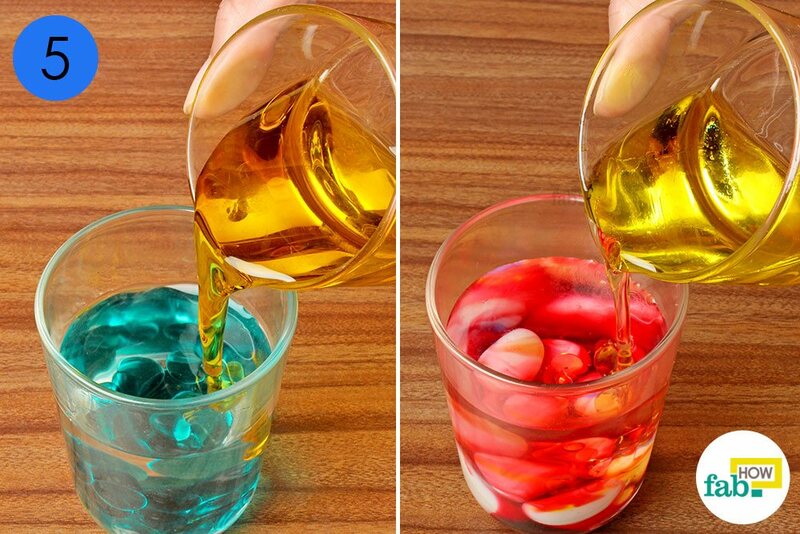 Pour about half cup of oil (either lamp oil or cooking oil like olive oil) into the glass cup. Place the wick (prepared in steps 1 and 2) over the glass cup. Make sure the whole wick is soaked in oil when you put it into the glass cup. The longer the wick, the larger the flame of the candle. Finish with lighting the wick! 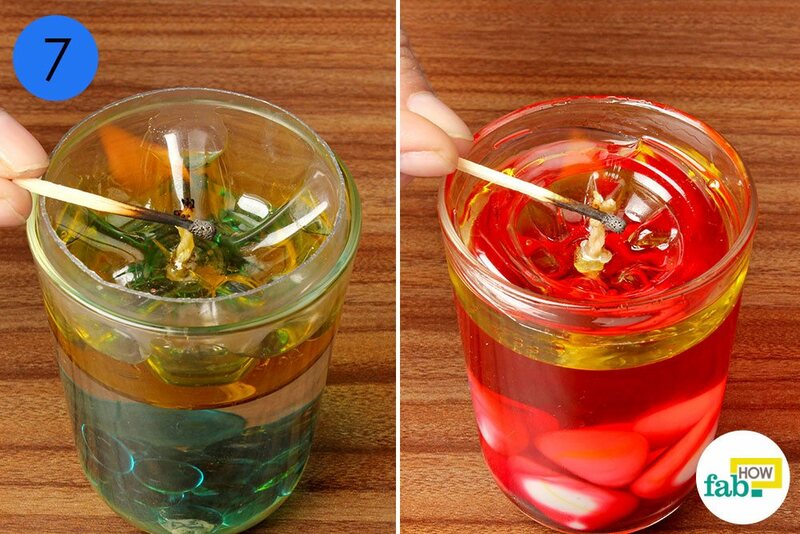 This homemade water candle can last several hours without burning the plastic. 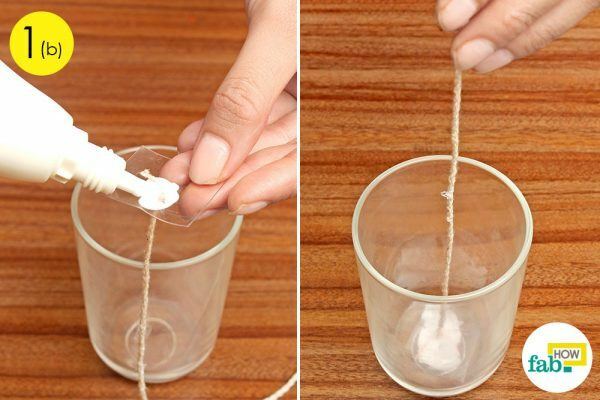 Run a candle wick through a bolt and tie a knot. Cut the wick to the desired length. 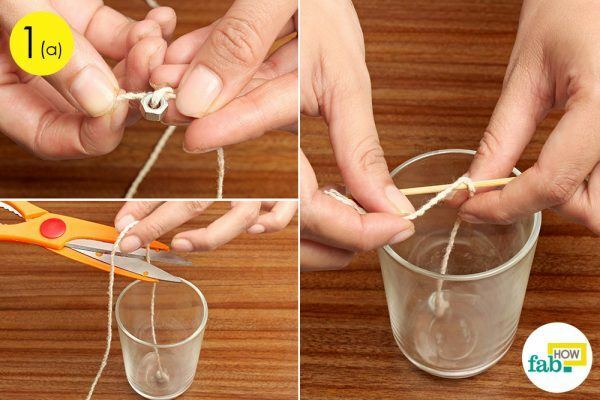 Tie the other end of the wick to a toothpick or cotton swab and balance it over the center of a glass cup. 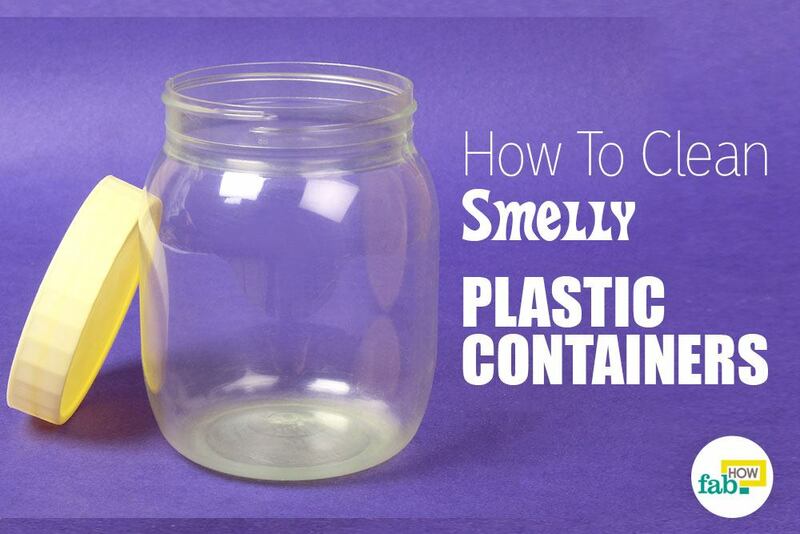 Grab a thick sheet of plastic and make a hole in it. Run your wick through the sheet and tie a knot. Apply a layer of glue on the sheet and place it in a glass cup. Permit the glue to dry and settle for 5 to 7 minutes. Put a small amount of vegetable shortening in a bowl. Add a small piece of your favorite colored crayon. Heat it in a microwave until it melts completely. Add a few drops of your favorite essential oil to the melted solution and mix it in thoroughly. Pour the homemade wax into the glass cup with the wick. 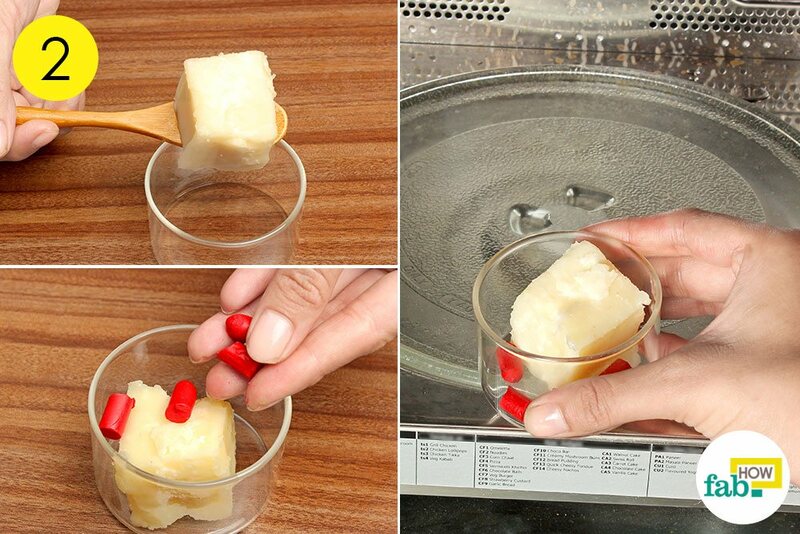 Allow the wax in the cup to cool for 10 to 15 minutes. 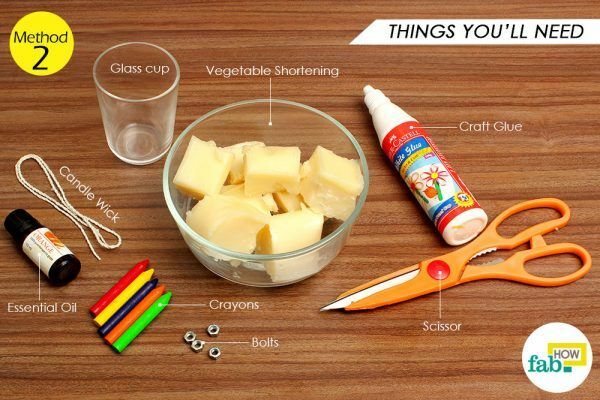 Follow the same method (explained in step 2) to heat and melt different colored crayons and vegetable shortening together. Fill in your favorite colors and allow each layer to dry before adding the next. 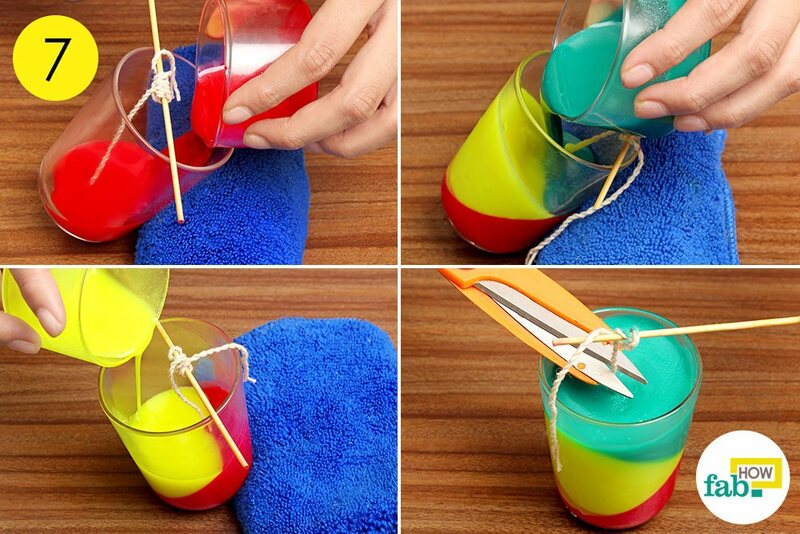 Cut away all the excess wick from the candle. 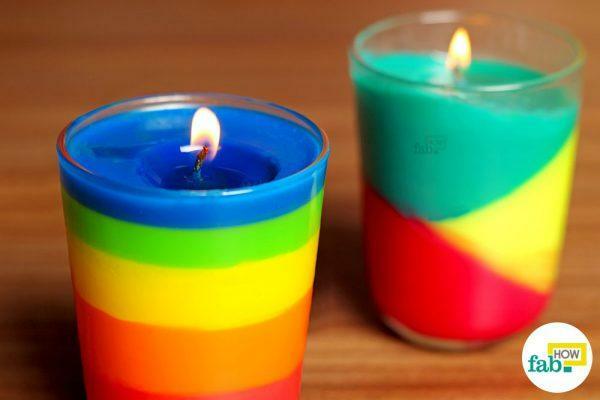 Light the wick and enjoy with your homemade candle. Alternatively, for a better pattern and design, tilt your glass cup at an angle of 60 degrees and slowly pour the melted wax into the glass. 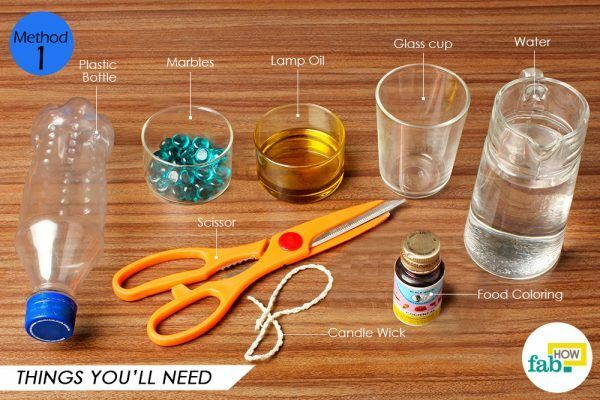 Alternatively, you can use coconut oil to help you make your candles without wax. Pick an orange or a grapefruit or another favorite round fruit and cut it into half. Gently with the help of a knife, pull out all the flesh from the peel. 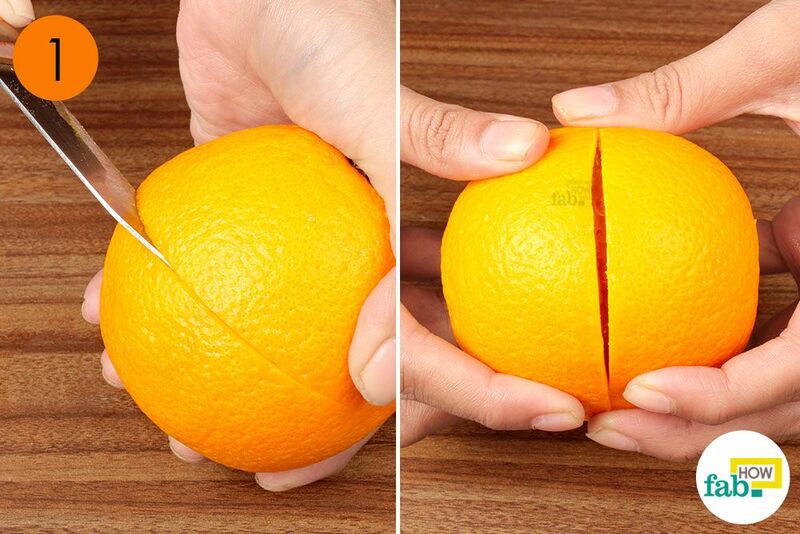 Work your way around the circumference of the fruit. 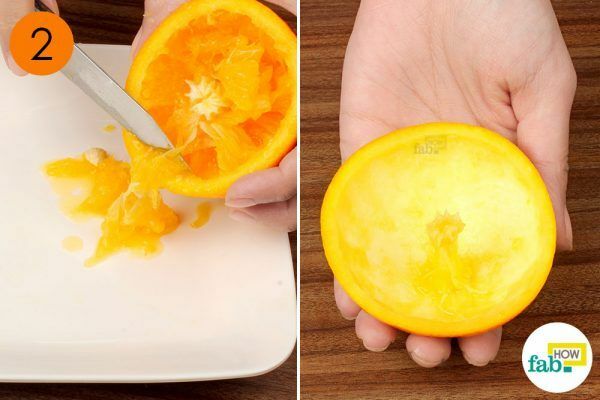 Make sure the center of the fruit is still intact while you work on the edges. This is what your fruit shall look like upon finishing. 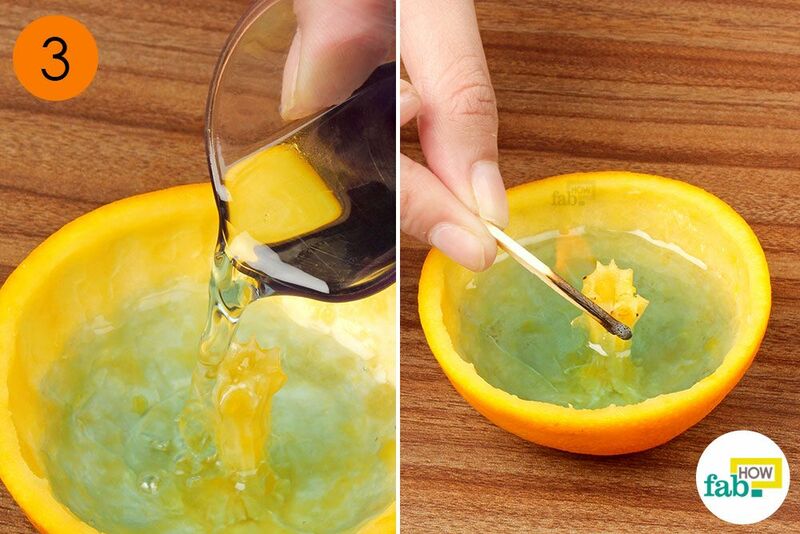 Now, fill the base of the fruit peel with Indian lamp oil or any type of vegetable oil you may have on hand. Make sure you pour the oil right over the center rind of the fruit (this works as your wick). 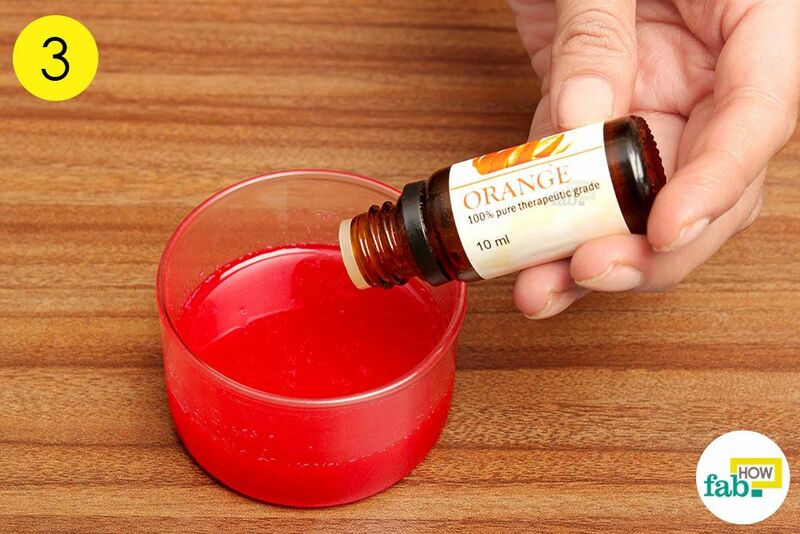 For more fragrance, you can add a few drops of your favorite essential oil (orange, lemon or grapefruit). 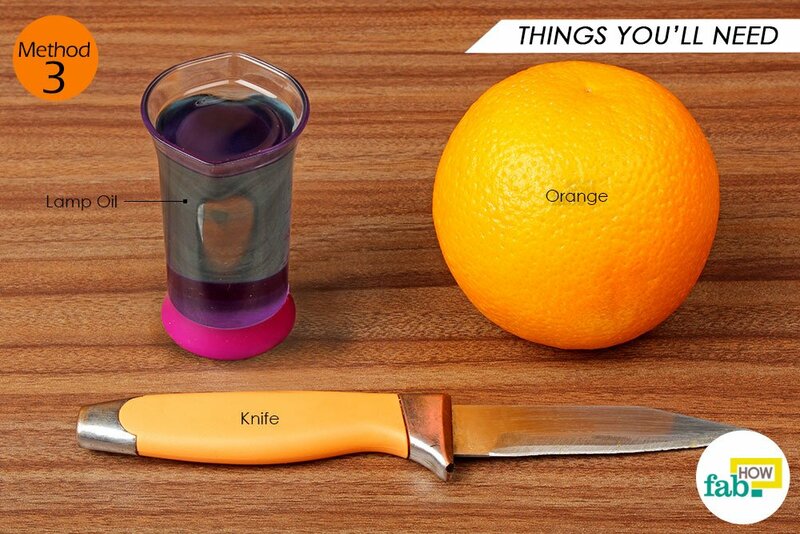 After slicing the fruit, using a spoon to scoop out the flesh is a feasible option. 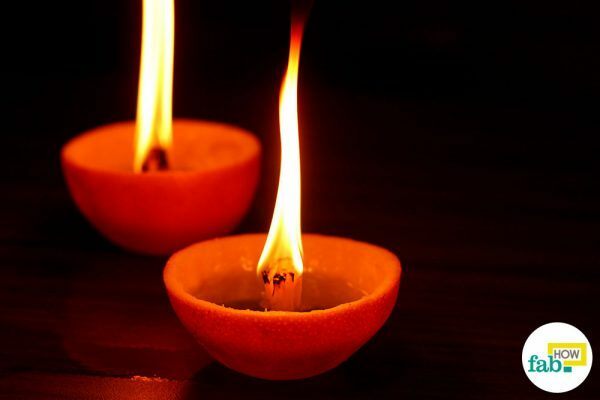 Place fruit peel candles on coasters, as the base gets hot very quickly. 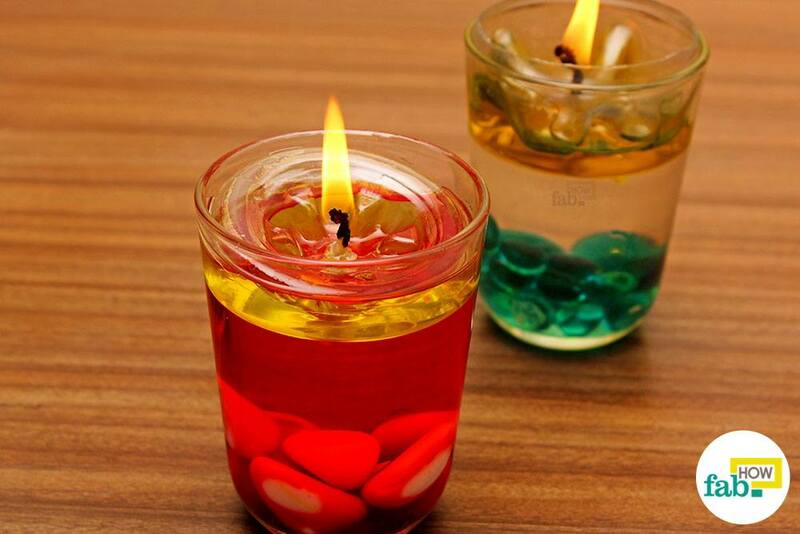 As per your choice, you can use sand or any other stone of your choice in the water candles. 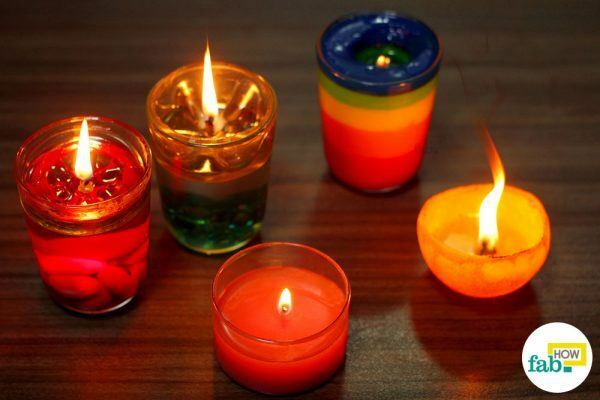 Be careful with using candles at home as they may leave stubborn wax stains on your fabric, especially in case of colored candles. You may also use disposable paper cups for making your candles. Be sure to keep an eye on them when burning to be sure they don’t catch fire. Thank you so much for your feedback. Do try them and let us know how it turned out for you. Is it possible to use a sort of extract instead of essential oil? WOW ? I love it? . Hummm, very interesting.?. I always wanted to learn how to make my own candles, instead of buying them from someone else. I’m going to make one, or at least try.. Then wether it turns out good?or bad? I let you know how it turned out. Thank you for sharing this technique with us. ??Bye? That was such a sweet comment. Do let us know how the candles turned out for you. Take care and stay blessed. Can you use food coloring for #2? Yes, you may use food coloring instead of crayons. Please let us know how it worked out for you.